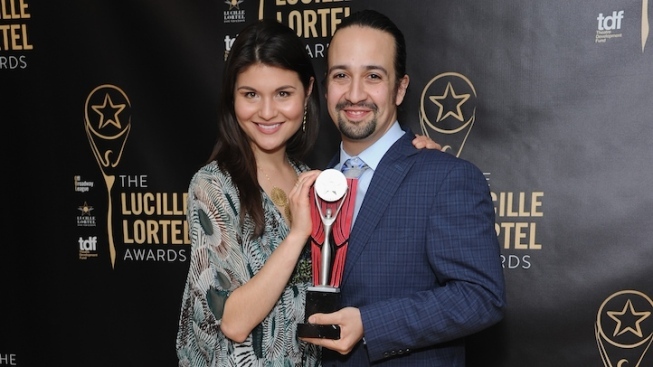 "Hamilton" stars Phillipa Soo and Lin-Manuel Miranda at the 30th Annual Lucille Lortel Awards. “Hamilton,” Lin-Manuel Miranda’s critically acclaimed musical about our nation’s founding father Alexander Hamilton, picked up a record-breaking ten honors out of ten nominations Sunday night at the 30th Annual Lucille Lortel Awards, which recognizes the best off-Broadway works. Among the awards The Public Theater’s “Hamilton” received was an Outstanding Lead Actor in a Musical prize for Miranda, statues for lead actress Phillipa Soo, featured actress Renée Elise Goldsberry, featured actor Daveed Diggs and the night’s top honor, Outstanding Musical. “Between Riverside and Crazy,” which won the 2015 Pulitzer Prize for Drama, was named Outstanding Play. Lead actor Stephen McKinley Henderson (pictured above) and featured actress Liza Colón-Zayas were also awarded prizes for their work in Stephen Adly Guirgis' dark comedy. The Fiasco Theatre’s stripped-down revival of Stephen Sondheim and James Lapine’s “Into the Woods” was named Outstanding Revival. Produced by the Roundabout Theatre Company, in association with McCarter Theatre Center, the inventive production featured just 10 actors and one major set piece -- a piano. Tonya Pinkins picked up her third Lortel Award, for her role in The New Group’s “Rasheeda Speaking.” The drama, directed by Cynthia Nixon, was filmed by WNET, Pinkins told NBC 4 New York, and it will be broadcasted for the local PBS stations four times. In addition to “Hamilton,” two other shows produced by The Public Theater received honors: Cush Jumbo’s “Josephine and I” (Outstanding Solo Show) and “Father Comes Home From the Wars (Parts 1, 2 & 3)” (Outstanding Featured Actor in a Play, for Jacob Ming-Trent). New York Theater Workshop's “Scenes From a Marriage” was also celebrated, for Jan Versweyveld’s scenic design. “Modern Family” star Jesse Tyler Ferguson, who can be seen in The Public’s Shakespeare in the Park production of “The Tempest” this summer, and “Veep” star Anna Chlumsky, who did double duty this season on Broadway in “You Can’t Take It With You” and “Living on Love,” hosted the evening (pictured above), from NYU’s Skirball Center. The show opened with a tribute performance to the off-Broadway smash “Nunsense,” which is also celebrating its 30th anniversary this year. The Lortel Awards named playwright Terrence McNally (“The Visit,” “It’s Only a Play”) the recipient of its Lifetime Achievement Award, and general manager Nagel Gibbs (“Wicked”) the recipient of the Edith Oliver Service to off-Broadway Award. “Fun Home” composer Jeanine Tesori became the first female composer to be inducted into the famed Playwrights’ Sidewalk. For more information on the winners, visit www.lortelaward.com.